Get the free Sanctum Secorum #37 Companion HERE! The story follows Robert Wolff, a man disenchanted with his life and his marriage. One day, while looking at a new house, Wolff discovers a strange horn in the basement. Blowing the horn, Wolff is transported to a strange new world, the World of Tiers. Wolff finds himself initially in an edenic paradise known as Okeanos. This region is the first level of the planet, which contains a number of tiers like a wedding cake, separated by vast mountain ranges. The entire planet is ruled over by a cruel and mysterious lord named Jadawin, who created it. Okeanos consists of a beach, an ocean, and a small forest and is populated by nymph-like humans who originated in and near ancient Greece. In this new world, Wolff regains his youth and vigor and falls in love with a local woman named Chryseis who lived in Troy at the time of the Trojan War. Welcome to the Sanctum Secorum podcast. 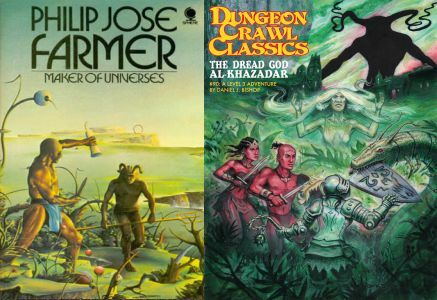 Tonight we discuss the Maker of Universes, the first book in Philip José Farmer’s World of Tiers series and pair it up with The Dread God Al-Khazadar. Get the free Sanctum Secorum #36 Companion HERE! Welcome to the Sanctum Secorum podcast. 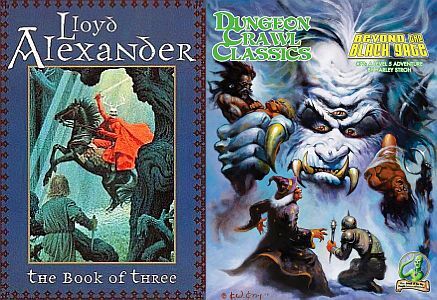 Tonight we discuss the Book of Three, the first book in Lloyd Alexander’s Prydain series and pair it up with Beyond the Black Gate! 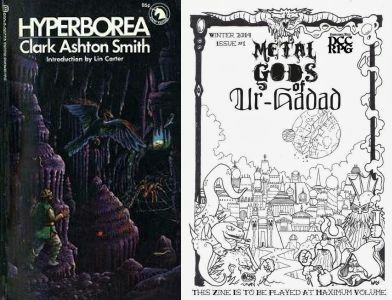 Get the free Sanctum Secorum #35 Companion HERE! Born in a tribe of fierce warrior women, Hundra has been raised to despise the influence of men. An archer, fighter and sword fighter, Hundra is superior to any male. Hundra finds her family slain and takes a vow of revenge until one day she meets her match. Welcome to the Sanctum Secorum podcast. Tonight we discuss the 1983 film Hundra and pair it up with The Trolls of Mistwood! Get the free Sanctum Secorum #32 Companion HERE! At age seventeen Don Miller is already an accomplished electronics technician, helping his uncle, Dr. Edward Simpson, with the testing of a new kind of submarine, the Triton I. Accompanied everywhere by his dog Shep, he is aboard the boat for its sea trials. The test run is successful, in spite of some problems with the control systems and stress on certain crew members that has made them believe that they have seen, on the television screens that give a view of the outside of the submarine, men encased in form-fitting bubbles. For the full test run the Triton will descend into the Milwaukee Deep, north of Puerto Rico. As they descend they find that they are losing control of the boat and, further, that they are being rammed by a whale. Unable to maneuver, they come down on an undersea plateau, twelve hundred fathoms (7200 feet) below the surface. When the bubble-men attack openly in full force, cementing rocks to Triton’s hull, they drive her down to the bottom. Three miles below the surface they come to a town of about 20,000 people that they call Atlantis. Lying under a larger version of the bubbles that enclose the people surrounding the submarine. The Atlanteans take the crew captive. Can they free themselves and save the surface world? Welcome to the Sanctum Secorum podcast. 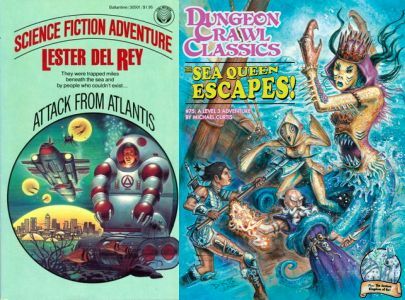 Tonight we look at a work by Lester Del Rey, Attack from Atlantis and match it up with Michael Curtis’ classic adventure, The Sea Queen Escapes. Get the free Sanctum Secorum #31 Companion HERE! In a world half of light, half of darkness, where science and magic strive for dominance, there dwells a magical being who is friendly with neither side. Powerful magical entities live on the night side of the planet, and for the most part the entities’ magical powers emanate from distinct loci. Jack of Shadows (also known as Shadowjack), is unique among the magical beings in that he draws his power not from a physical location but from shadow itself. He is nearly incapacitated in complete light or complete darkness, but given access to even a small area of shadow, his potency is unmatched. Jack is a thief who finds himself betrayed and unjustly punished. So he embarks on a vendetta. He wanders through strange realms, encountering witches, vampires, and, finally, his worst enemy: the Lord of Bats. He consults his friend Morningstar, a great dark angel. He is pursued by a monstrous creature called the Borshin. He journeys from nightside to dayside, casting aside his soul in his quest for vengeance – and possibly redemption. Welcome to the Sanctum Secorum podcast. Tonight start our year off with a work by Roger Zelazny coupled with Harley Stroh’s The Jeweler Who Dealt in Stardust. Get the free Sanctum Secorum #30 Companion HERE! Like others who withstood the pandemic, Sam Sewell lives in a subterranean shelter. The vast catacombs were built before the military’s biological weapon leaked out, killing nine out of ten people and leaving the survivors so traumatized that they can barely tolerate each other’s company. So it’s quite peculiar that some government agents seem to think that Sam lives with a woman, Despoina, who’s suspected of conducting germ warfare. Pressured by the agents to locate Despoina, Sam must literally go underground to discover the truth about a hidden world of witchcraft and secret rituals. 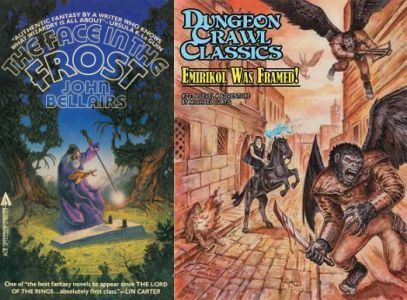 This Wiccan-themed science fiction novel was cited by Gary Gygax as an inspiration for Dungeons & Dragons. 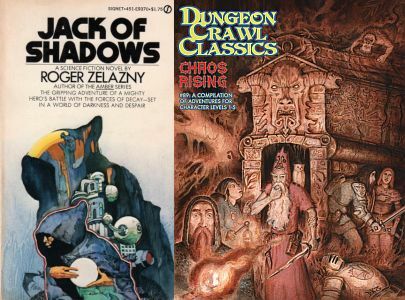 Sharp-eyed gamers will certainly see similarities between St. Clair’s world and Gygax’s Castle Greyhawk with its labyrinthine setting of multiple levels connected by secret passages. Welcome to the Sanctum Secorum podcast. 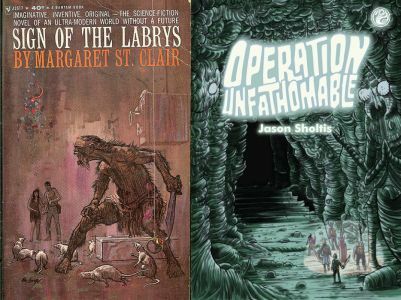 Tonight we return to the works of Margaret St. Clair with her novel Sign of the Labrys and talk about the forthcoming DCC compatible work from the Hydra Collective, Operation Unfathomable.